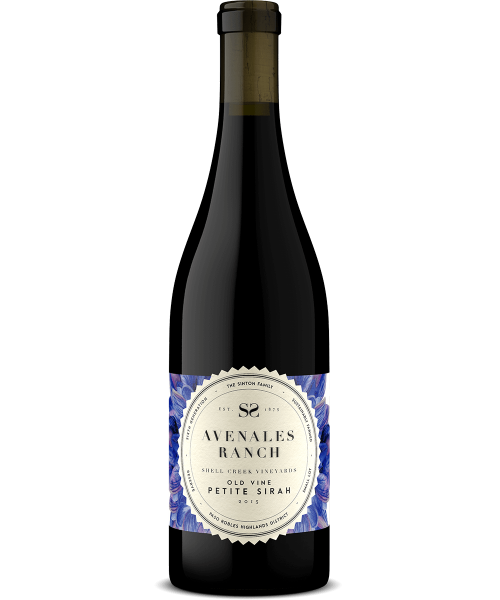 Our Old Vine Petite Sirah is sourced from our heritage block (Jane’s Block) planted on its own roots in 1972. These are the same grapes that have made world class Petite Sirah for some of the finest wineries in California for decades. The vineyard is planted on a gentle hillside beneath limestone cliffs in a climate that is ideal for this fruit; hot days and cool nights. The 2015 vintage was an marked by its unusually short supply and thus we only made 120 cases. Following up on our Double Gold win in 2014, the 2015 has deep blackberry notes with dark purplish color with a shimmering rose zircon edge and a well rounded balance of tannin and acidity. Enjoy with a juicy steak (buy a grassfed one straight from the ranch by emailing daniel@avenalesranch.com), lamb, a hearty bolognese pasta, or a chocolate dessert.